Jade's kittens have been moving off of the back porch and roaming around in the trees now. Yesterday their Uncle Momo (our Japanese Bobtail cat) taught them how to climb trees. Now it's all they want to do. Sergeant Zim (left) prepares to engage in fierce kitten battle with Oreo (right). Oreo, having been knocked down a branch, looks forlorn. Did you know that Possum Creek Knifeworks has a Facebook page? Clearly many of you did not! Through the Memorial Day weekend and until Tuesday, receive free shipping if you use the coupon code "memorialday" with any purchase! It's raining today so I don't have enough power to do much in the workshop, and can't work on my other projects outside ... so I tried my hand at something new. Pipe making, as you may have guessed from the title. From some scrap wood I had laying around I was able to carve out a decent enough pipe. Certainly not bad for a first try. So I'm going to go back to the University of Youtube and see if I can't learn a little more on how to do this, and then find some pipemaking supplies online and see what's available. It uses all the tools and skills I already have and handcarved pipes would be a nice addition to my shop, I think. Here's to expanding your base! One of the problems with the internet age (and there are many) is the lack of time to sit back and ponder. A person asks you a question or makes a statement, and you respond before your thoughts have fully had time to gel. Some questions could take ten years or a lifetime to answer properly, but we must respond within minutes. This hurried thinking and speaking is foolish and I wonder what it is doing to our minds when we do not have time to pursue thoughts down and properly digest them. A man whose food was not properly digested would become sick; do not our thoughts need also time to digest? I must get back to the hoeing of the weeds, or else soon I shall not be able to see the garden, much less harvest in it! A sharp hoe, a cold glass of tea, and many long breaks makes the work easier, but it doesn't accomplish as much as a sharp hoe and a strong back. Once again I'm reminded that I should limit my activities on internet forums to just special interests such as homesteading and gardening. There's no purpose in political forums or the "outrage club" that meets every day to discuss the latest horror from the worldly culture. Imagine that you are the empty vessel that the New Testament describes you as. What should be poured into that empty vessel? Good things, or bad? And how little of the bad would have to be poured in with the good in order to taint the whole vessel? So you won't see me discussing political or social issues on forums for now. Well, it's time for a new idea, and I've got one. This one is specifically for you knife collectors out there, or also perhaps for folks who like to give away knives as gifts to their friends and family. 8 unique knives, all throughout the year. That's 1 knife per month sent straight to you for a set price. 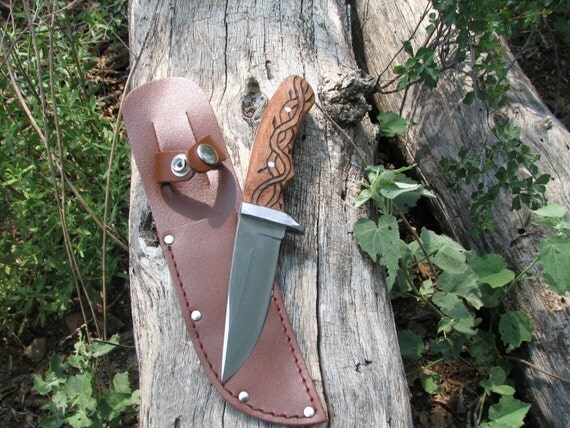 This allows me to have some money up front to continue making knifes, and gives you the opportunity to get some unique knives and have a lot of input into the process, as well as supporting a craftsman. Because the money is collected up front, it gives me the ability to cut the price per knife significantly. So where I normally sell these knives for around $70 and then collect $10-15 for shipping, you'd be getting each of your 12 knives for the average cost of $62.50 and not have to pay shipping at all. In addition, I'll be running special deals each month exclusive to the club members (and on top of the regular sales that I run). I'm still working out the details, but I'm ready to begin discussing it if you're interested. Contact me at miradus01@hotmail.com or you can convo me at Etsy. This was just taken outside of the east window of our cabin. The storm passed overhead earlier and dropped a few sprinkles but then worsened in the northeast. Some tornados apparently were spotted or touched down just east of here but we didn't see any of it. Here you can see the magnificent edge of the storm at sunset. Sales are way down this month in the knife shop. Time to hit the ol' Ebay and see if we can shake some money out of the money tree. This is one of the knives I'm going to be selling. When I put them up for auction, I start the bidding lower than what they sell for normally in Etsy, so with some luck you can get a deal. There's always a buyout option though for somewhere around the normal price (sometimes a little higher). For whatever reason, more people look at Ebay than Etsy so this gives me a chance to expand my market. I've also got another idea I'm cooking up right now but haven't worked out the details yet. Whew, it's hot. Since there's not much getting done, I thought I'd take a few pictures for you. Grinning kid who is always lurking on the porch. I think he's one of ours. Hot dogs moved up to the shady pen where they can sit in the cool dirt under a shade tree. Alright, this is from down in the gardens looking back up the hill towards the pond. The white pipe is part of our siphon system to bring water down out of the pond, only there's just a 6' drop there. Right now the pond level is so low that the intake is below the outflow and therefore the system won't work. I'm having to pump water using a pump and the generator. I fill this tank up every 4-5 days, but when the garden is really going it'll take filling every 3 days. Pepper plant with stray okra seeds growing. The okra will eventually dominate this pepper plant so one or the other needs to be moved. Stray okra apparently got seeded everywhere. This is a patch of prairie verbena growing down by the garden. It's pretty and the bees love it. While technically a "weed", it'll grow anywhere there is disturbed soil. I am a great disturber of soil (and the peace). Cucumber plants growing up next to the fence. They'll eventually wind their way up that fence and give us lots of cucumbers. Hopefully. Swiss Chard, probably my favorite green veggie. Decimated cabbage plant, probably my least favorite green veggie. They're in bad shape, aren't they? The cabbage cutworms are munching away. Here's one of the culprits now. Fat, isn't he? Looks well fed to me. Oh, how cute. He's a family man! Today, I think the cabbage goes into a burn pile before I end up with a permanent infestation for the next 300 generations of cabbage worms. The plant nursery. Little fellows growing in pots. I dip them in the big buckets to water them. When they're ready, they'll be spread around the rest of the garden. Looking up the hill from the garden towards the driveway and the pond. There's grass! Green growing grass! That's kind of a big deal around here. It's not yet 9am and I've been driven from the field of battle. A complete rout. Our brave forces were forced to quit the field with only 60% of the enemy destroyed. The cause? It's now 94 degrees outside in the garden. Even clad only in my shorts and sandals (and my battered gardening hat), I am sweating like Eric Holder during a congressional hearing. I don't know if I'm going to go barefoot in the workshop anymore. Ran out there after dark to grab something I'd left behind and found one of these suckers crawling across the floor. There's been a lot of discussion as to where the actual seat of the soul and thought is. Some folks believe it is the brain while others believe it's the heart. I shall wade into this scientific debate with what is the only true science: personal observation. The floor of my workshop is dirt. The best part of my day is the early morning when I walk out to the workshop and then slip off my sandals. No thorns, no itchy plants, no biting insects, and no snakes. Just the cool embrace of the soil from whence we all sprang. Thoughts flow between the dirt and the soles of my feet. Raw energy seeps in and inspires me to creative and productive thoughts. God visits me here and He stands barefoot. Our cat Jade had kittens not too long ago, and we're trying to name them. There is a boisterous black male kitten who dominates the rest. A compromise was proposed of "Sergeant Fluffy Wuffikins" but it was rejected by both parties. I'm still learning how to do some of the more complex Celtic knots and such. The narrowness of a knife handle also lends itself well to Celtic stylized vines. Plants and all of nature are my inspiration. Those of you who have followed my knife posts probably are recognizing that I use the same photo locations over and over. This is a fallen oak log that's about 30 feet outside of the backdoor on the way to the pig pen. Because of the light color of the weathered wood, I like to use it to highlight the darker handled knives. It's also where I tend to take photos of knives in the afternoon as the shadow of the trees don't interfere. This one really came out better than I expected. These new tactical blades I bought are slightly more expensive than some of my other blades, but they're so much better steel and they have a great balance and feel to them. When we first moved here, there were many thorny plants which would scratch and snare the tender foot. Some plants would burn the skin if you brushed up against them. And there were rattlesnakes and other biting and stinging creatures lurking in the grass. So I wore heavy boots as if going to war. I wore long, coarse pants that covered my legs. Now, after a year of walking to the needful and pleasant places, we have worn sandy paths. The thorny and weedy plants have retreated, leaving behind sand and rocks and some hardier flowers growing along the paths. Now I wear shorts and sandals. The land has not been conquered by my feet. If I stray off the paths, I will encounter the land's strongest warriors, waiting to pierce and sting. If I give up those paths, for even a short time, those warriors will return and the fight will begin again. We do not fight, for now, but rather an uneasy truce has been established, as if nature is saying, "I will cede this much to you, but no more"
Well, I finished gluing all the pipes together and waded out into the pond to put a float on the check valve. So we were ready for test # 2. Water will flow, for awhile, but it eventually shuts itself off. Also, you can't lift the outflow end of the pipe more than an inch off the ground or it shuts off. I had THOUGHT that the end of the pipe simply had to be lower than the "T" joint up on top of the tank dam, but it appears that was wrong. The outflow has to be lower than the intake valve in order for the system to work. The siphon portion of this is to get the water out of the pond and over the tank dam, not to make water run uphill indefinitely. Duh. I spend $250 that I really couldn't spare on this project to free us from the tyranny of the generator and an electric water pump (our solution now for getting water down to the garden). It's very disappointing that this didn't work. I don't have a survey level thingy that you can measure the rise and fall of the ground over distances. That would have helped a lot. I think that, if the pond level rises back up to its normal level, then this system should start working, but it means that in extended drought and such that we won't be able to siphon water out of the pond. Essentially the system won't work when we need it the most. Weeds are encroaching upon the taters! To war! Rain finally stopped so I went out with the camera and took some photos. Rain gauge says a quarter inch, but it's broken and leaks out anything greater than a quarter inch. Ah well. That's normally not a problem round here. Out by the garden and facing west. You can see another storm coming in on the horizon. Good! We need a big one. Bottom of the valley in a mesquite forest. This is a Momma Kildeer who thinks I'm trying to catch and eat her baby. Jade, the Momma Cat who MIGHT catch and eat the kildeer's baby. Working on that for the next couple of days. It'll be a big fork, a meat cleaver, and a big meat carving knife. Started on the cleaver today. Got an "ouchie". That baby is SHARP. And here's two knives that were finished today. They'll be up for sale in the Etsy shop here soon. I'm not sure why I seem to be obsessed with creepy-crawly things lately in my design work. Maybe it's because spring has me checking my boots carefully. This morning on the radio I heard some wags going on about how the ragweed pollen count was high and it ought to be eradicated. Radio wags ought to be eradicated! About 600 years ago or so, ragweed was abandoned by humanity on this continent in favor of corn. Until that time, it was an important grain crop for early man. It kept us alive! Without ragweed, there might be no radio for the wags to go on. We abandoned ragweed and it thrived still, growing up and making us sneeze to remind us of its importance. It's seeds are tastier than corn, and healthier for us. When we've finally hybridized corn to its final weakness and a disease wipes it all out, we may have to fall back on eating ragweed again if humans wish to survive. So leave the ragweed alone, radio wags. As usual, you don't know what you're talking about. In the 24 hour period of today, I had exactly 7 people visit my Etsy shop to look at knives. Normally I have at least 40. I think it's time I found a new radio show to advertise on. The last one was cheap and sold me a lot of knives, but I think it's off the air now and there's a lot of drama associated with that. I would prefer to distance my business from any drama. Plus, that audience is sort of mined out. Are there any other good internet radio shows that might fit? I don't really know what's out there these days. I need to find either an internet radio show or put up a banner on a forum somewhere. 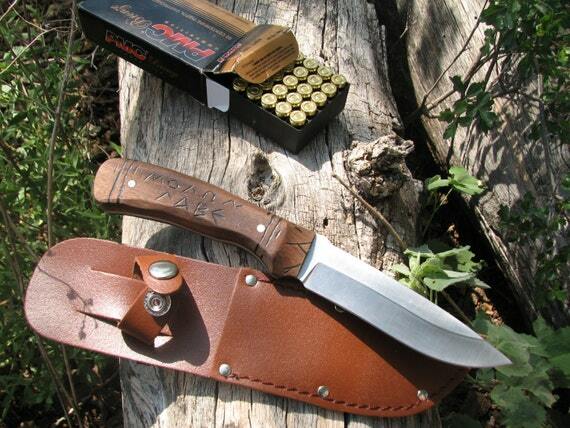 Trying to decide if I should add Green River blades to my inventory. It's a famous (and old) name brand of blades that collectors seem to like. They aren't very expensive either. I don't have a lot of interaction with flesh and blood people these days. At least not people outside my family. My main window into the world and the current thoughts of people is the discourse on internet forums. I have two male dogs. Normally I put them on two separate chains in two separate locations. They get into trouble when I let them run together. But last night, after a long romp through the fields, I decided to put them both into the same pen. I was reminded most of the night why I had stopped doing that before. Their purpose is to bark at danger or trouble and alert me to it. But they will often bark at nothing. Only when they're in the same pen, one will bark (possibly at something real) and then the other will take it as a sign of aggression and they will fall to fighting each other. So I lay there in bed, in the wee hours of the morn, listening to dogs fighting and wondering if the original thing that one of them barked at might possibly be real. This greatly resembles the internet. There is a patch of Mexican Hat growing out in a bare patch of ground near my workshop. It's a very pretty plant, but it ignores me. It very deliberately ignores me. It has absolutely zero regard for me. It is a very unsocial plant. We have two watchdogs here on the farm. One is in a pen behind the house. The other is outside on a chain on a fence by the garden in front of the house. This way I know (theoretically) if anything comes around. A few nights ago, the dogs were making one heck of a ruckus outside at about 3am. I couldn't see anything out the window to be alarmed at. It's very dark here, since we're off-grid and don't have outside lighting. So if I ever look out the window and see a light, I know it's someone up to no good. I certainly would not want to go poking around some hillbilly's shack in the middle of nowhere late at night with no light. The dogs were going crazy and so I armed myself appropriately and slipped out the back into the treeline to see what was going on. Nothing was moving. No lights. After about ten minutes of observation, I determined that it wasn't a human out there and I flipped on my headlight. Sam, the dog at the back of the house, was scared out of his ever-lovin' mind. He was hiding in the middle of his pen by a big oak tree there, his head down and whimpering. Normally when I'm investigating strange stuff at night, I flip open the gate so he can run out into the dark ahead of me. This time he wouldn't go. Unh uh, no way, boss. So this left Fang. I slipped down to the garden to see if I could turn him loose so he could go out into the night to try and find whatever had been spooking them. Fang is chained up more in the open than Sam is, but he's a much bigger dog. He's part German Shepherd, part Lab, and part Rhino. Fang wasn't where he was supposed to be. He'd climbed OVER the garden fence (6' high) and was now in the garden, on the opposite side of where he is normally chained. If his chain had been 2' shorter, he would have hanged himself when he went over that fence. Whatever it was, it scared him so bad he climbed over that fence to get away from it. Didn't find any tracks in the morning, nothing was missing or damaged, and none of the wild-roosting chickens had been taken. Still don't know what it was that came calling. I've found a new supplier for some of my knife blades, so I can lower my prices a bit. I think this has been a sticking point for some of my customers in the past. Well, as much as money is ALWAYS a sticking point when you're wanting to buy something. I don't make a lot off of each knife as it is. I added up the costs and time once and came out right around minimum wage. On a more complicated design, a significant amount less than minimum wage. Still though, I'm in my workshop doing what I love doing instead of assembling burgers and listening to some pencil-neck drone on about mission statements. Lowering prices and selling more knives is going to be the goal for May.